Thankfully there was no hangover for the Rowdies from last week’s loss at the hands of New York Red Bulls II. 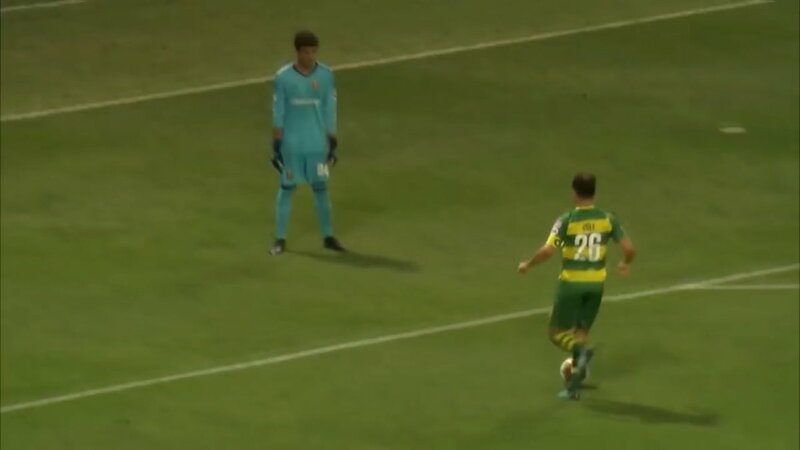 The Rowdies put in a sturdy performance in every area of the field to dispatch the Real Monarchs, one of the league’s best Western Conference sides that had not lost a match until Saturday night. With last night’s win, the Rowdies have gone unbeaten at Al Lang Stadium in the regular season for exactly a year. Their last regular season loss at home was against the Charleston Battery on April 22. The Rowdies travel to face the Battery next week to kick off a three-match road trip. Now would be a good time to start turning that road form around. 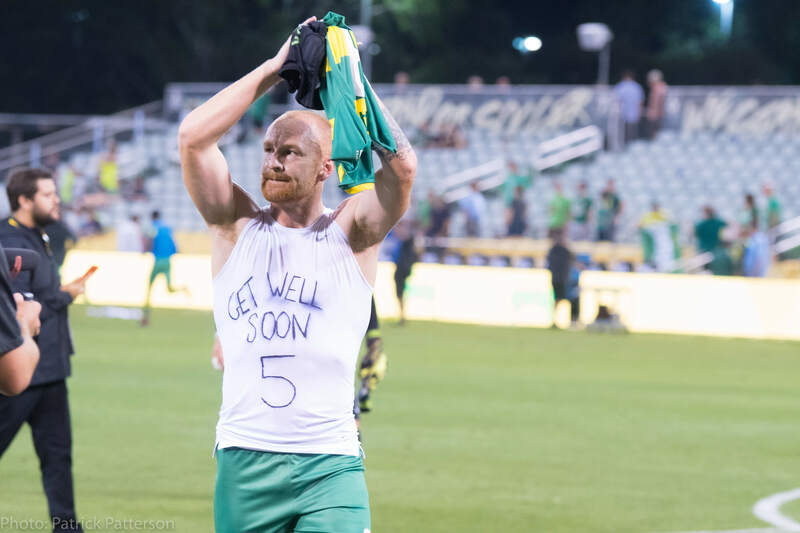 The guys coming out all wearing the #5 in support of Najem was a classy display and just another example of how close-knit this group is. That camaraderie is what will pull this team through the tough times. Last night was the team’s opportunity to show everyone that the result at RBII was a fluke and with a three-match road trip coming up, the lads needed a strong performance to carry them in to a difficult road trip. Curinga had an excellent debut. Local kid, making his debut, against his former club, and with his grandmother watching, there were a lot of emotions for him, but he kept that in check and gave a professional performance. After that display, I’m encouraged for the rest of the season. Great to see the team bounce back after a terrible road performance and persevere through one of the most tense matches I’ve seen in a long time. Sometimes winning involves skill, sometimes luck, and sometimes witchcraft. I think we used a little bit of each of those tonight. That was a movie-script quality night for Kyle Curinga – gets his first start, for his hometown club, against his former club – and puts in a quality performance for 90 minutes. Jochen Graf is going to score a goal through sheer willpower in the very near future and the resulting celebration will probably include a mushroom cloud. This wasn’t a must-win game in terms of “saving the season” or any such stuff, but if their aspirations are to be a true contender for the USL Cup, winning this game is a hell of a statement maker in that direction. Another great home performance. Joe Cole was the Joe Cole of legend, Marcel Schafer is starting to impact games… If only they could replicate all of this on the road. The Jekyll and Hyde performances are mind boggling. What do you think was going on in the mind of David Ochoa at this moment right before Cole shook him off inside the box and slipped the ball into the empty net? Cole,36, showed tremendous pace and energy on both scoring sequences last night. Georgi Hristov certainly owes Cole a nice fruit basket for the way the Englishman set him up for his 57th career goal for the Rowdies, matching Derek Smethurst’s scoring record that has stood for 40 years. It’s just a matter of time now before Hristov surpasses Smethurst. Cole, who already announced this will be his final season as a player, won’t be catching the Bulgarian, but he’s a decent position to make some serious moves up the modern era scoring chart if he keeps playing the way he did last night. As pointed out by Rowdies supporter Adam Martin on Twitter, Cole has tallied 18 goals since joining the Rowdies in 2016, which is the fourth highest total in the modern era. Cole needs five to surpass Aaron King (22) and six more to jump Mike Ambersley (23).